Along the years, the Romanian people have had to defend their territories against different invasions, such as Hungarian, Ottoman, Tartar or Russian. More often than not, leaders of the country would celebrate their victories by erecting a monastery or a church mostly from the 15th century on. 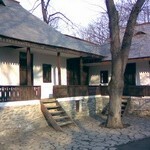 This is why there are now so many monasteries in Romania, each with its own rich historic background and beauty. These places are not for those of you who just want to party but for those who want to relax and really enjoy nature with its beautiful colors as well as historical heritage and spirituality. The richest in monasteries is Moldova, as the most famous monasteries in Romaniacan be found there: Putna, Voronet, Moldovita, Humor and Sucevita. Putna Monastery is the first and most important one built by Stephan the Great (Stefan cel Mare), Moldova’s ruler in medieval times (he succeeded in building 44 monasteries). Legend has it that before one of his many battles, Stephan was worried so he went to ask for advice from the hermit Daniel. He showed Stephan a certain place in the woods and he told him that if he erected a monastery there, he will definitely win the battle. And that’s how Putna appeared. Another valuable monastery built by Stephan the Great is Voronet, also known as the Sistine Chapel of the East due to its amazing paintings. What is interesting about this one is that it was built in only four and a half months, in 1488, which is a record for those times. The color blue used for this monastery, popularly named Voronet blue, has remained a mystery as no one knows the composition the painter used to create such a bright and vivid color. This is where the hermit Daniel (Stephan’s advisor who is now a saint) is buried. 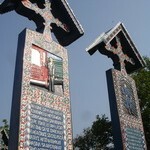 The oldest monastery in Moldova, dating back to 1407, is Neamt Monastery. Within its courtyard there are two churches, a bell tower with 11 bells, a Christian high school and a museum with ecclesiastic objects. In one of the churches, there is a miracle-working icon of Virgin Mary, painted in 665, in Israel. 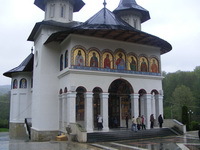 Generally, people choose Moldova when monasteries are the main destination. 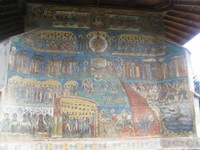 However, wherever you are in Romania you will surely find such a holy place to visit. 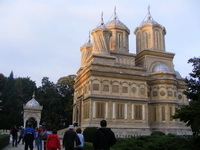 A famous one is Curtea de Arges Monastery, in Southern Romania. Though it is a spectacular place, this monastery is more famous for its legendary construction than its architecture. They say that king Basarb wanted to build the most beautiful church ever and ordered architect Manole to do so. However, everything that Manole and his team would build during the day, would collapse during the night. Then, Manole dreamt that in order for his construction to stand up he would have to make a human sacrifice. He told his team this dream and they agreed to build in the first of the wife or sister that would come to visit them. The first one who appeared was Ana, Manole’s wife and he had no choice but to build her into the construction. When the church was done, Basarab ordered that Manole and his team be imprisoned in one of the church’s tower so that they wouldn’t erect another similar church for no one else. Manole tried to escape, so made himself a pair of wings. He managed to fly couple of meters but then he crashed and died and on that place, a fountain appeared. Whoever visits the monastery, nowadays, will be taken to see the place where Ana was built in as well as Manole’s fountain. So, even if you choose one of the most famous monasteries in Romania or another one not as impressive, you will still get to step into legendary times, each with its own customs and beliefs. You don’t have to be Christian to enjoy visiting these places, you just have to like listening to this kind of legends and to imagine they are nothing more and nothing less than the actual truth.